New York fashion designer Naeem Khan, who proposed five months ago to incorporate a vocational school of fashion into his original concept of constructing a design studio on the Miami River, is still on track to open by mid-2019 and is currently in the process of working with the Miami River Commission and Miami-Dade County Public Schools to make sure that the grand opening of the design studio and vocational school go as smoothly as possible. 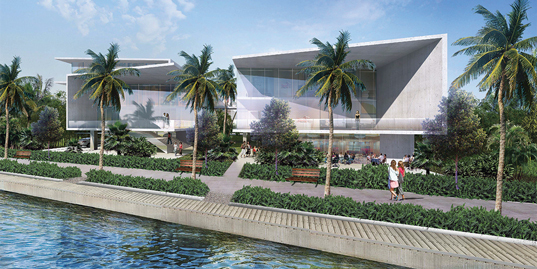 The design studio, which is to open in a county-owned site at 1175 NW South River Drive under a long-term lease agreement with Miami-Dade, will front more than 200 feet of the river’s south shore, with dockage planned for the entire length along a 25-foot-wide riverwalk. As a result, the Miami River Commission recommended in March for Mr. Khan to incorporate revisions to his original plan so that the project can continue to move forward without any issues. Since then, Mr. Khan said, he and his team have been working on plans to extend the riverwalk under the 12th Avenue Bridge, which will connect with a pedestrian staircase on the west that leads back to the on-road Miami River Greenway. Literally no one is asking for this. The bourgeous people who care about fashion will not be caught dead in this neighborhood. The trend of labeling a for profit commercial development as a “school” is at best disingenuous at worst fraud. The facility is not meant to attract “bourgeous people” but rather to reinvigorate the fashion industry in Miami. By reading more into the story you will see that they plan to add 70 full-time jobs in the design and manufacturing facility that will be the Naeem Khan HQ. Additionally, opening a Fashion and Arts School will support a workforce training and education pipeline to ensure the future success of the project. Immediate pessimism is a dangerous ideology but not uncommon on the internet. I would suggest you do your research before putting any of your thoughts in writing. Disingenuous? Fraud? It is no surprise anymore when people throw around nasty soundbites for the sake of seeing their name in print. Seems to me this is going to be more of a manufacturing facility accompanied by a school. Seems to be a perfect location and what a tremendous opportunity for students to gain real life experiences from a Master! And nobody can deny the importance of JOBS creation. Welcome to Miami, Mr. Khan!